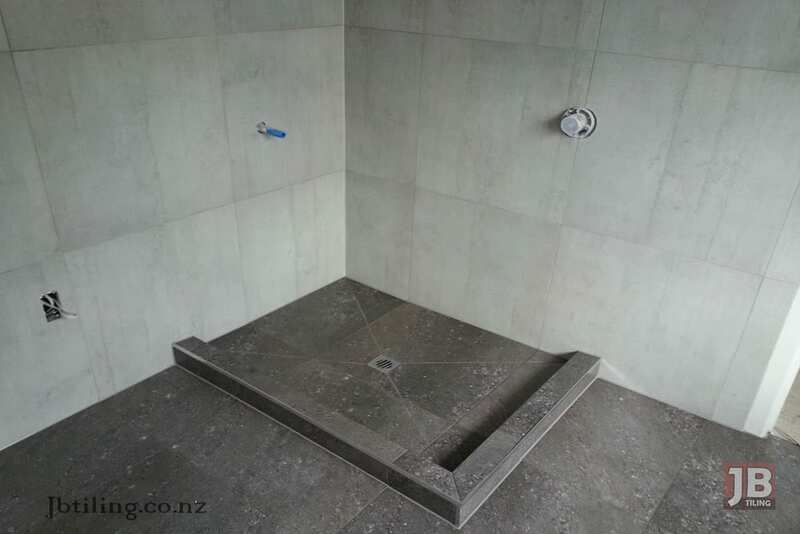 Over 25 Years Experience In Tiling and Waterproofing Residential and Commerical Properties in Auckland. 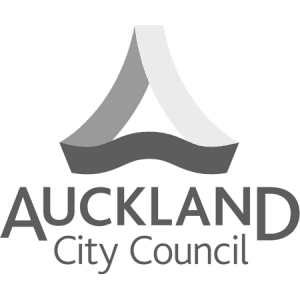 Fully Qualified by BCITO and NZQA – Auckland Council Approved. JB Tiling is your local qualified specialist in all aspects of tiling and interior waterproofing. Based in West Auckland, our service area extends to all of Auckland and it’s wider regions. From interior to exterior floor and wall tiling, floating tile decks, tiled swimming pools and just about anything that can be tiled, JB Tiling can produce a quality finish that lasts! JB Tiling Auckland is also fully qualified, council approved and registered to carry out any interior waterproofing work that you may require. Bathroom waterproofing, showers and every wet area can be waterproofed to an industry and council approved standard that will pass code of compliance for total peace of mind that your premises won’t leak. You can trust JB Tiling to produce the very best tiled finish in your home or commercial property that will not only look great but also stand the test of time. When you hire my team, you will be provided with professional, reliable and quality work right through the entire process from prep work like floor levelling/screeding, tile underlay and waterproofing, all the way up to tiling and grouting. I have built my business upon a solid foundation of trust from customers and other tradesmen from around the Auckland area to establish a mostly referral based business that is sustained without the need for advertising or outreach. It is a telling testament to my quality of work and honesty with pricing that I have managed to maintain a growing business upon word of mouth and positive testimonials alone. When you hire JB Tiling for your next tiling or waterproofing job, you can be assured that you will be getting the very best finish completed to an industry standard. This is all done by a hardworking and experienced family team that will provide the result quickly and without any hidden costs or budget blowouts. 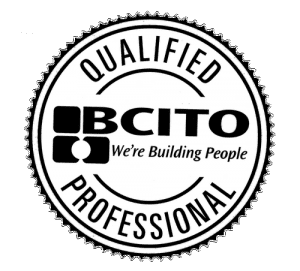 We are fully trained by BCITO and qualified NZQA tilers and waterproofers that guarantee work completed to a national standard using only approved materials made for New Zealand conditions. You can find out more about me and how I have built JB Tiling to what it is today and how I’m the right choice for your next tiling project. So get in contact with me today for a no obligation, free quote, and I look forward to hearing from you. 6 Reviews from happy customers. Over 25 years experience in tiling houses and commercial properties in the Auckland area. Affordable, quality and professional contracting work. Fully NZQA and BCITO Trained and Council Certified. Prep-work, floor levelling, screeding, waterproofing, tiling and more! Getting your bathroom tiled can be one of the most exciting and satisfying projects you could do in your home. Not only does it drastically improve your quality of living on a daily basis with a modern, fresh and functional bathroom with all the latest fittings, a tiled bathroom will also boost the value of your home. Not too mention the bragging rights and the envious looks you will get from your friends and family! Also, remember that tiling a bathroom, is more than just an investment in your home; it’s also an investment in your family. A modern bathroom not only creates a healthy living environment by helping eliminate mould and bacteria build-up in aged or rotting surfaces, you can also customize it to best suit the needs of you or your family. Have small children that you need to bathe but do not have the luxury of a large bathroom to accommodate a bathtub? A small combination shower/tub can be fitted into even the smallest of bathrooms, complete with waterproofed walls and surrounds and then tiled over, you will have a fully tanked and waterproofed bathing area that will withstand the mightiest of splashes from your kids, not to mention it’ll also look great. Is one of your family members in a wheelchair or has difficulty climbing over shower ledges? We can waterproof and tile an edgeless dropped floor shower that anyone in a wheelchair can smoothly glide into without the worry of having water flowing all over the bathroom floor tiles and beyond. A sloped shower base can be formed and tiled that will direct the water flow into the drain, ensuring that all the wastewater goes there and nowhere else. Even if you would only like to spruce up your bathroom to give it new life without any special requirements, tiling the walls and floors will dramatically change the room. If you book a free measure and quote from me, I can offer free tile consultation and advice on which tiles would best suit your space to ensure the most attractive and practical finish. Choosing a tile can be daunting with the myriad of designs out there and purchasing a tile ill-suited for bathrooms could result in your new bathroom turning into an ice-skating rink or a cleaning nightmare! I pride myself in steering people away from bad tile choices that will only result in deep regret later. You can trust my advice as I work with all sorts of tiles on a daily basis and know which tile suits an application the best. From measuring and quote, to surface preparation like laying tile underlay, floor levelling and waterproofing, all through to tiling and grouting, you can be assured that JB Tiling will provide the best solutions and result to your bathroom tiling project. 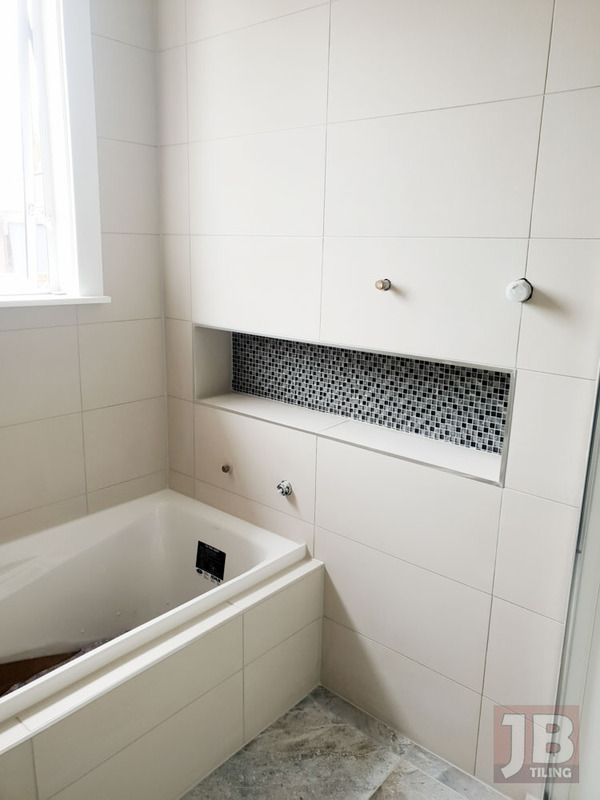 Of course, JB Tiling does more than just bathroom tiling in Auckland, click on my service page to learn about the other aspects of tiling that we cover. Having exterior tiling done in your home or commercial premises can dramatically increase the street appeal, wow factor and general appearance of your property. First impressions really do matter and there’s no better way to impress your friends and family or clients than getting your front entrance tiled. JB Tiling can provide a free measure and quote of your desired area, a tile consultation to help you choose the best outdoor tile to maximise the areas potential and to ensure your new surface is safe in all weather conditions. No two tiles are alike and it’s imperative to choose a tile that will not only look great and complement your home or commercial property but also provide grip when wet and can endure external elements without excessive staining. Exterior tiles are a long tasting and great looking surface that offer easy maintance in comparison to other outdoor surface options. 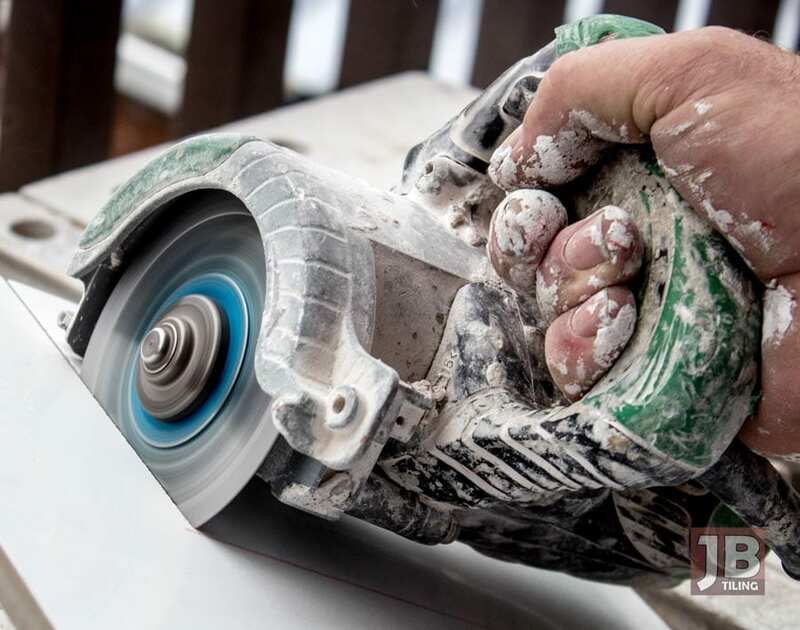 JB Tiling will thoroughly prepare the surface before any tiling is started and will inform you of any issues that need addressing before work is commenced. Existing expansion joints will be carried over to the new tiles to ensure no cracking occurs during the changing of Aucklands seasons. All tiling materials we use for exterior tiling are made to New Zealand conditions and are BRANZ approved. Getting your deck tiled is a popular and beautiful way to make your outdoor entertaining area look great and also endure the kiwi lifestyle and elements. However, new regulations have limited deck tiling to a certain extent in an effort to stop leaking homes. 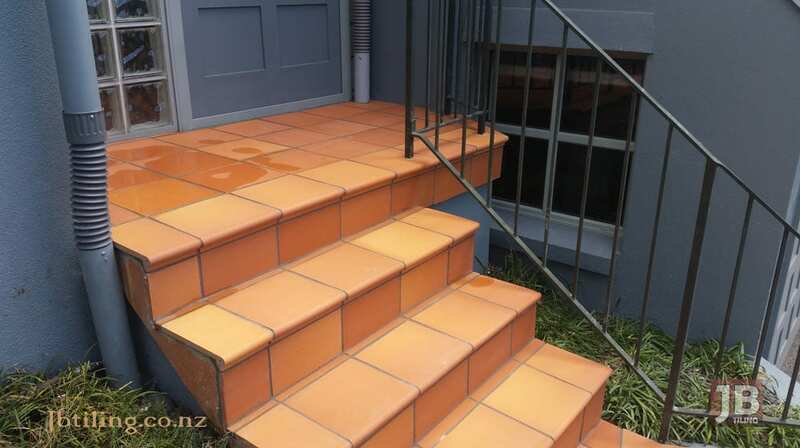 Auckland council specifications no longer permit tiles being laid on decks with traditional adhesives and waterproofing systems. 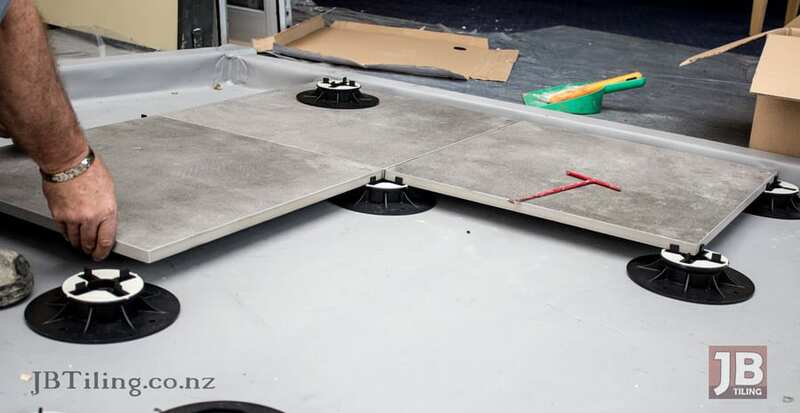 To get a deck tiled in Auckland, you now require getting a specialist outdoor waterproofer to install a certified membrane and have the tile laid on deck jacks. These floating deck jacks for tile are placed on top of the waterproofing membrane and they hold the outdoor tile in place without the using of any adhesives or screws. JB Tiling has experience with this floating tile system ever since they became regulation a number of years ago. Using deck jacks, we can lay a floating tile over your deck that will withstand the pressures of traffic and everyday life while allowing water to drain naturally. Floating deck tiles do not require any grout which makes maintenance much easier and they come in a variety of designs to suit every home or commercial property. JB Tiling can supply the floating deck jacks and organize a certified outdoor waterproofing specialist needed to properly tank your surface before tiling is commenced. All that you need to do is select a floating deck tile and enjoy! To learn more about what we offer, visit our tiling services page. Just got new tiles laid in your home? Learning how to clean tiles is essential to make sure you get the most of your investment. Thinking of doing a bathroom renovation but have no idea where to begin? This article will walk you through what is involved and how to designing your dream bathroom.